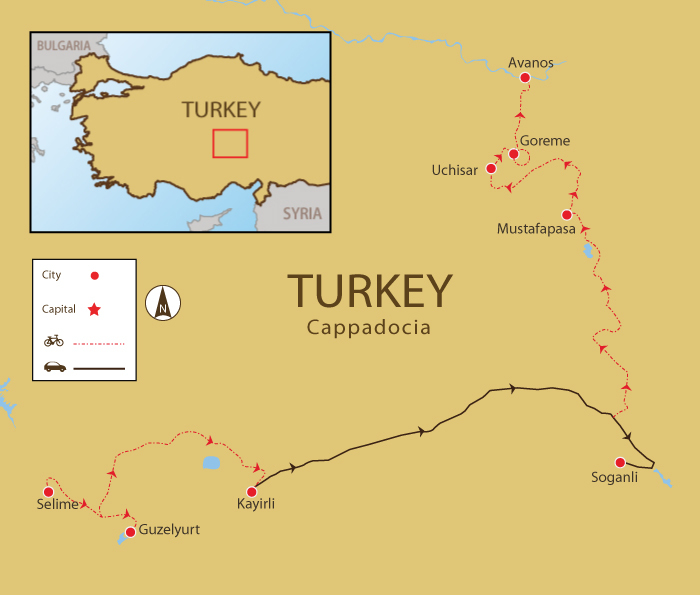 Deep in the heart of Turkey Kapadokya, ancient volcanic eruptions dispersed thick ash, which solidified into a soft rock—called tuff—tens of metres thick. Wind and water went to work on this plateau creating a fairy tale landscape of cones, pillars, pinnacles, mushrooms, and chimneys. Thousands of years ago, humans took a cue from Mother Nature carved tunnels into the soft rock, and an underground urbanized landscape was created, living at one with nature rather than imposing upon it. This moderate mountain biking tour is a journey of adventure and discovery, taking to a network of little used dirt roads and not too technical single track MTB trails as it winds its way across the region – including the Ihlara Canyon, Soganli Valley, and the “Fairy Chimney” landscape that stretches from Mustafapasa to Goreme. Combining the best of remote, wilderness off road adventure biking with plenty of sights, sounds and new experiences along the way. It’s this mix of attractions that makes Cappadocia such a compelling destination and we discover the most captivating highlights, escape the tourist crowds and discover the true character and charm of this magical place and it’s people, by bicycle! This tour includes a total ascent of 3,567 metres. Recommended additional activity in Goreme: Discover Cappadocia from a different perspective by hopping on a hot air balloon ride. Enjoy the beautiful scenery while drifting leisurely over the region's fairy chimneys, stunning rock formations and picturesque valleys. Contact us for more information. We meet up at Kayseri Airport then transfer to Selime for a welcome dinner and trip briefing. 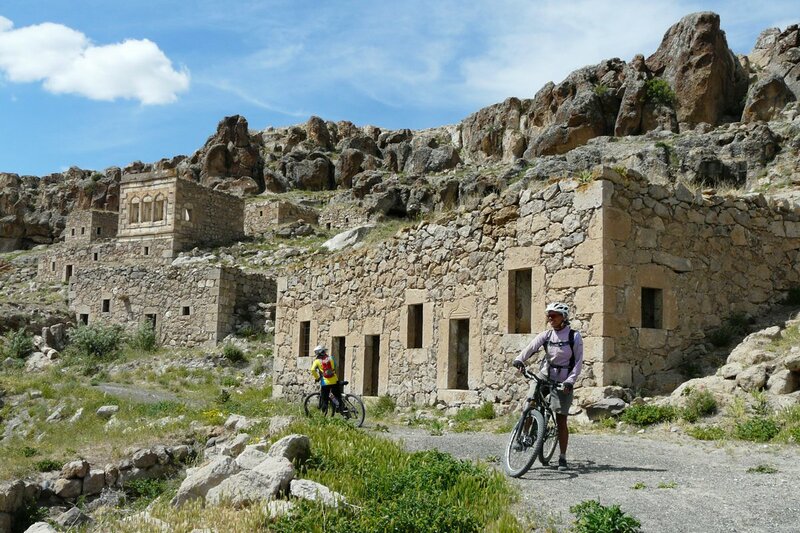 Visit Selime's monastery made of rock and ride a single-track trail through Ihlara Canyon. Enjoy great views of the Malendes Mountains as we cycle to explore the fascinating underground city of Guzelyurt before heading to our cave hotel. A ride up to Sivrihisar rewards us with fantastic views over the plains. Rolling through the grassy plain, we reach the beautiful crater lake called Nar. Lunch by the lake before cycling on to Gaziemir, home to a huge underground city complex. After our visit, we transfer to our family pension in Soganli. Bike through quaint villages on a hilly road to Sahinefendi Pass before descending to Damsa Valley to visit the Roman ruins at Sobessos. Later, we head to the Medresse and Selcuk Mosques at Taskinpasa and the monastery at Keslik. Cycle through Gomeda Valley towards Ibrahimpas Village and get a stunning panoramic view on Karlitepe overlooking Goreme Valley. Then down to Uchisar and through fairy chimneys and eroded rocks in White Valley, we head to Goreme. Ride Rose Valley and the barren Devrent Valley, taking us to the 13th century fortified trading post, Sarihan Caravanserai. Bike on to the Kizilirmak River leading us to Avanos for a market stroll and head back to Goreme for a farewell dinner. Day 2 - Selime - Ihlara Village - Guzelyurt Ride 40km. +660m. Our bike guide, Hami, did an outstanding job of showing us many special places of interest and beauty, and describing the cultural and historical significance of sites. As a local, he has many favorite places to see on bike, hike and stroll around villages. Every day Hami reviewed our expectations and made sure our trip dreams were met. Hami is warm and charming, attentive and a good listener. He took us to some really great restaurants, from small village eateries to lovely elegant dining. With Hami's guidance we saw some of the world's most wonderfully exotic natural beauty and experienced some of the kindest most welcoming culture. I absolutely loved this trip and love seeing the world on bike. The team on the ground in Turkey were fantastic. Hami was a great guide and tweaked our tour to suit us. The van backup driven by Mustafa was also second to none. I would happily recommend our trip to anyone wanting to go mountain biking in Turkey. We ride 191 km, about 80% off road, in 5 cycling days. There are first-class single-track trails to gentler dirt roads. We will be riding through valleys, alongside and into streams, and there will be some climbing. Please note the daily ascents and descents listed. There is limited vehicle support on this tour due to the remoteness of the trails. In case of an emergency, we will be able to call for assistance. Please bring a camelbak or similar hydration system for water and to carry snacks. Your guide’s expert knowledge of the area and terrain means that you always know what is coming up in terms of distance and difficulty. We use a nice variety of accommodation, including a family guesthouse, a historic Greek hotel, and a special cave hotel for two nights with a swimming pool. Your luggage will be transported between hotels. Suitability: You should be confident of your physical condition and bike handling skills. Some climbs are challenging, so you should have a good level of fitness to cope with more than 1,000 m of climbing in a day. As mountain biking surfaces require competent bike handling skills, it is advisable to have off-road and preferably downhill experience, although difficult obstacles can always be avoided. Suitable for cyclists with a keen attitude and adventurous nature! Biking Conditions: This tour follows a mixture of single track, trails, and gravel paths as well as sections of tarmac. The daily distances aren't long, and we will be stopping to see sights along the way. We will welcome you upon your arrival flight at Kayseri Airport and transfer to your hotel in Goreme. The rest of your day is free. In the evening, we meet for a trip briefing and dinner. In the early morning, we take a 1.5-hour transfer to Selime, a city with more than 100 churches from the Byzantine period. We get our bikes fitted ready for our adventure. From Belisirma, we climb out of the canyon, following quiet asphalt and dirt roads to Ihlara as we approach the wide-open rolling foothills of the Melendes Mountains. We climb steadily to the village of Kitreli, where we stop for lunch. From here, it's downhill to Ilisu village and then on to Guzelyurt on a lovely dirt road, with commanding views over the flat lands and canyon below. We arrive in Guzelyurt's Monastery Valley, a charming historical part of the town with lots to see, including 19th-century Little Hagia Sofia, underground cities (don't forget a torch! ), and rock-cut churches. Tonight, we relax our muscles in one of Cappadocia’s finest “Konak” luxury boutique hotels and enjoy a real taste of Ottoman grandeur. Today's ride takes us up to a 1780-m pass at Sivrihisar with fantastic views over the plains below. The route descends through the old, deserted part of the village to Red Church, one of the oldest Cappadocian Orthodox churches, dating from the 5th or 6th century. From here, we cross “yayla”, a green pasture surrounded by mountains where you will see shepherds and their flocks. Following a dirt road across the grassy plain, we spot our first “fairy chimney” rocks before descending to Nar village. This section can be impassable after heavy rain due to clay and mud; in which case, an alternative asphalt route is available. We climb up through the old village and arrive right on the crater of Nar Lake, an awesome extinct volcanic caldera, whose sulphurous waters are ever-changing greens, yellows and blues. You follow a rough dirt track down to the lakeshore for a picnic lunch. We then continue downhill through Sofular Valley to reach the little-visited village of Gaziemir, home to a huge underground city complex that is worth a visit. While we are exploring Anatolian rural life, there are also plenty of photo opportunities before meeting our driver in Gaziemir. After visiting the underground city, we transfer to Soganli for a night in the traditional, homestead style cave rooms of Emek Pension and enjoy a delicious meal on the terrace. Amidst photogenic scenery, today's ride is a perfect balance of restful freewheeling and memorable historic sites. This morning starts with a circular bike tour around the valley to visit several incredible rock-cut churches. We cycle on asphalt and single-track trails past Guzeloz to the lovely little village of Baskoy. From here, a wide dirt track leads up through green trees to Debenbasi, at the head of the canyon. Then we gradually climb up over the Sahinefendi Pass before dropping down into the Damsa Valley, where we visit the Roman ruins at Sobessos, unique in Cappadocia. After a picnic lunch, we follow the road north, stopping to visit the Medresse and Selcuk Mosques at Taskinpasa and the monastery at Keslik. From Cemil, we turn onto a dirt road for a scenic ride through vineyards, fruit trees, and “fairy chimney” valleys. We overnight at Mustafapasa and have time to explore this fascinating historical Greek village before relaxing for the evening in the comfort and splendour of our hotel - one of the region’s most enigmatic historic buildings. We ride through some of Cappadocia’s most memorable terrain. From Mustafapasa, we follow a very scenic dirt road through Gomeda Valley and climb slowly on a beautiful dirt track that takes us up towards Ibrahimpasi village, a picturesque, unspoilt place with plenty of local charm. We continue to a panoramic viewpoint on Karlitepe, high above Goreme Valley, and enjoy one of the area’s most stunning horizons. From here, a rough dirt track takes us downhill to the town of Uchisar that is dwarfed by an imposing rock hewn hill fort. After a wander through, we'll have lunch, and then it's time to hit the trails again. Riding on a dirt road that skirts the canyon edge of White Valley, we'll have fantastic views of fairy chimneys and deeply eroded rock scenery. We ride directly to Goreme and visit the Open-Air Museum to see the region’s finest examples of rock-cut churches and frescoes. We overnight in lively Goreme where there are a wide range of cafes, bars, and restaurants. We ride on a dirt road for a superb circuit of Rose Valley and a visit to the Church of Columns on the way. We climb up through the barren Devrent Valley and enjoy a long downhill track that brings us out at the majestic Sarihan Caravanserai, a 13th century fortified trading post on the Silk Road. After a break in the ancient courtyard, we head off on an easy mountain biking trail that follows a stream with many water crossings (be prepared to get wet!) and meet up with Turkey’s longest river, the Kizilirmak. We follow paths beneath shady trees along the riverbank, past picnic spots, and on to Avanos, a quaint town famous for its quality ceramics. Avanos is a perfect place for a leisurely drink in the square or a stroll through its many bazaars and markets. Finally, we take a scenic dirt road tour back to Goreme. We meet up for a special farewell dinner at the nationally renowned Orient Restaurant. Because some people can't imagine going on a trip without their own beloved bicycle, we do not provide them as part of this tour. However, you can hire bikes locally for the price listed in the tour pricing section. The bikes are Specialised Rock Hopper Comp mountain bikes with lightweight alloy frames, 30-speed Shimano gearing, disc brakes, and front suspension. If you bring your own bike, please make sure it is a mountain bike, preferably with front suspension, in good mechanical order. Passport holders of up to 78 countries, including the UK and Australia, are not required to obtain a visa when entering Turkey and are permitted to stay in the country for a period of 30 days at least. US citizen are required to have a visa and this can be obtained online through E-Visas. Please check with the Turkish Embassy for further details. Turkey has seven distinct climatic regions, the area between the coast has moderate winter temperatures and hot, humid summers, and the inland areas with their extremely cold winters and excessively hot summers. In Cappadocia, from May through late June and even into early July the days are warm and the nights are cool. July and August temperatures hover around 40 C/100 F, too hot for cycling. By mid-September the temperatures have fallen and are comfortable through to late October. Sun cream is a must! Meals are included as per the itinerary where B = breakfast, L = lunch, D = dinner. Turkish cuisine is a fusion of Middle Eastern, Central Asian and Balkan tastes. Known for the use of fresh ingredients, dishes are simply presented, not hidden under sauces, or excessive presentations. There are many regional specialties and variations – there are at least forty ways to prepare eggplant alone – to try on this tour. Keeping you completely hydrated is a job we take very seriously. Cold water, some energy-restoring soft drinks are included in the tour price while riding. Soft drinks and other beverages during meals are not included. But you may also want to bring electrolyte in powder or tablet form. Alcoholic drinks are available everywhere, but are NOT included in the price. We recommend that you tuck away a few extra liras for possible incidentals that might arise. It is always wise to have some paper currency in case of ATM absence or credit card problems. This will save you a lot of unnecessary worries. It is also customary to tip local tour guides and drivers; however, the amount you give should be dependent on the level of service you receive. The Turkish lira is the currency. ATMs dispense Turkish lira to Visa, MasterCard, Cirrus and Maestro card holders and most machines offer instructions in English, French and German. You can usually draw out about $470/ €350 per day. The Euro and the US dollars are the favorite foreign currencies. Overall, the level of petty crime is much less than in most Western countries. However, take the usual precautions about avoiding rowdy political demonstrations, not flashing money around and being aware of pickpockets in crowded places.